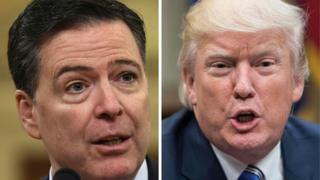 Twitter users have been reacting to the latest twist in a long-standing feud between ex-FBI chief James Comey and US President Donald Trump. In an ABC interview on Sunday, Mr Comey - who was sacked last year - lashed out at Mr Trump, describing him as "morally unfit to be president". His comments came ahead of his upcoming tell-all memoir about Mr Trump. Anticipating this, the president earlier set off a barrage of tweets directed at the former FBI boss. Mr Trump fired Mr Comey last May, while the FBI was investigating possible collusion between the Trump campaign and Russia in the US presidential elections in 2016. Twitter users have been using hashtag #ComeyInterview to stake out where they stand in the growing row between the two men, and react to the Sunday night interview. Sarah Reese Jones, managing editor at PoliticusUSA website, argued that that Mr Comey "just destroyed Trump" in the TV interview. Another Twitter user, who goes by the name Toby2Names, agreed that Mr Comey "may have some good points", but added that the interview was a publicity blitz for the book. David Axelrod, CNN commentator and former strategist for Barack Obama, questioned the timing of Mr Comey's book. Josh Schwerin, communications director at Priorities USA - a Democratic Party political action committee, argued that although Mr Comey's "inappropriate actions disrupted an election", he still could be "a valid source of damning information about Donald Trump". Mr Schwerin was apparently referring to Mr Comey's investigation into defeated Democratic candidate Hillary Clinton's handling of classified emails on a private server while she was the secretary of state. In July 2016, the former FBI boss decided not to press charges against Mrs Clinton - only to reopen an investigation in October, just days before the presidential vote. Mrs Clinton says it handed Donald Trump the victory. Attorney Seth Abramson picked up on what he described as "the horrible irony" of Mr Comey's actions at the time. Sarah Kendzior, a political writer, chose to focus on Mr Comey's ABC interview, criticising "superficial questions". She said that Mr Comey "needs to be asked questions by Congress at a hearing, not on a TV special". George Stephanopoulos, the ABC News chief anchor who interviewed Mr Trump, asked whether the president actually watched the interview. A number of Trump supporters - like Scott Presler - defended the president, thanking him for firing Mr Comey. Brenda Brown, argued that Mr Comey's upcoming memoir was "a book of revenge" after his sacking by Mr Trump.